You see reflective tape every day and every night. But have you ever stopped to think how it works? Reflective tape (also known as retro-reflective tape) works by reflecting light back to the light source only. In other words, the tape only lights up for the person with the light source or in line with it. For example, lets say two people were walking down a street with one person on each side of the street. If person “A” has a flashlight and shines it down the street at some reflective tape on a trailer the tape will light up for them. However, the person on the other side of the street will probably not see the tape light up. If both shined a light down the street they would both see the tape. This happens because the tape contains either glass beads or prisms that collect light, focus it and bounce it back to the source. How does it do this? Imagine that you are in a round room and you are in the center of the room. If you throw a ball towards the wall it is always going to come back to you. Reflective tape works in a similar manner. The diagram below shows how the glass beads or prisms do this. As you can see from the diagrams above, the tapes refract or bend light in such a way that it always goes out the way it came in. That brings up another amazing capability of the reflective tape. In the first diagram one person had a light an the other did not. If both had lights, both would see the tape light up. What is amazing about this is that the tape does not have to be horizontal to the viewer for it to reflect light back. It can also shine multiple beams back in multiple directions. Flat against the light is best but even at sharp angles you will get a good return of light. Another thing to remember about reflectivity is that your eyes have to be in line with the light for you to see the tape reflect. Next time you are out driving at night and are behind a tractor trailer truck notice how you can see the reflective tape light up when you are far back. As you get close at a stop light you will notice that the tape no longer lights up. This is because the angle from the light to the tape and then to your eyes has become too great. In other words, it makes a big difference where the light is in relation to your eyes. 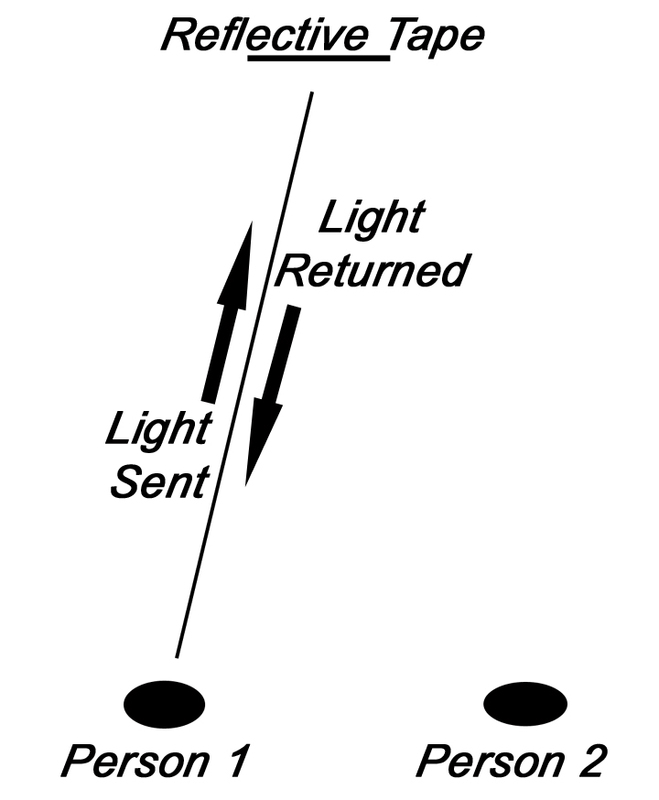 If you were holding the light close to your head then the reflectivity would not change as you moved closer. In our article on the difference between glass bead tape and prismatic tape we will cover the geometry of reflective tape in more detail. We have a complete line of products at our main store website www.tapedealer.com .